Successfully Added Video Door Phone - Night Vision, Weather Proof, 7 Inch LCD Display, Electronic Unlocking, 700TVL Camera to your Shopping Cart. Find out who’s at your door and interact with your visitors before providing them access to your property. With this LCD Door Phone you’ll significantly increase the security level of your home or business. When your doorbell is pressed the large 7 Inch indoor display will alert you and provide you with a visual image of who is waiting in front of your property. Its two way audio functions allows you to safely communicate with your visitors without having the actual need of opening your door – brining in extra security and convenience for you and your family. 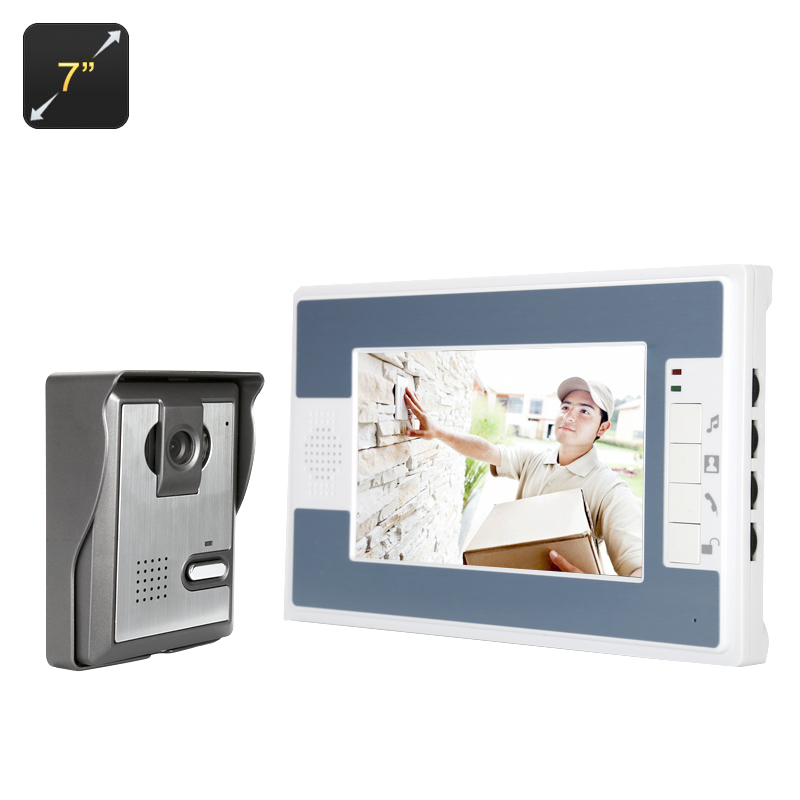 If your door has an electric lock then you can simply connect it directly to the system of this Video Door Phone, allowing you the possibility to unlock your door and grant people access to your home by the simple touch of a button at your video door panel. This Video Door Phone comes with a 12 months warranty, brought to you by the leader in electronic devices as well as wholesale video door phones and security gadgets..
Arabic: - هاتف باب الفيديو - Chinese Simplified: - 视频门电话 - Czech: - Video dveřní telefon - Dutch: - Video deurtelefoon - French: - Vidéophone - German: - Video-Türsprechanlage - Hebrew: - הדלת וידאו טלפון - Hindi: - वीडियो दरवाजा फोन - Hungarian: - Videóinak kaputelefon - Italian: - Videocitofono - Japanese: - ビデオドアの電話 - Korean: - 비디오 문 전화 - Malay: - Telefon video pintu - Norwegian Bokmål: - Video dør telefon - Romanian: - Uşă video telefon - Russian: - Видео домофон - Spanish: - Video teléfono de puerta - Thai: - วิดีโอประตูโทรศัพท์ - Turkish: - Video kapı telefonu - Vietnamese: - Video Door điện thoại.